People seem to be enjoying roguelike-ish, Metroidvania-esque platformer Dead Cells, and if you count yourself among their number, perhaps because you got a whopping saving on the game a few days ago, you might be pleased to hear that it's just received a new update that adds a brand new, mysterious biome, and more. The 'Hello Darkness' update whacks in that new biome, of which developer Motion Twin is being enigmatically, mysteriously cagey: "Some say it will get you nowhere but six feet under… But IF you know your way around like a dog knows its bone, you shouldn't have too much trouble finding it!" Well, alright then. Cheers. 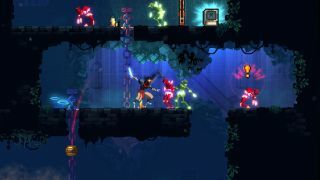 There are also two new monsters added to the early access Dead Cells, along with tweaks to the economy, additional weapons, and changes to the way the island setting links together. You can read the full patch notes here.